I painted this during our worship service this morning. I had prayed and asked the Lord what colors to use, but other than that, I had no plan going into worship. I am an abstract painter. I paint with my hands and fingers. I have not been able to use a paint brush the last few times I’ve painted. I tried to use one today, but had to put it down. It’s something that I believe the Lord is doing. I have asked Him to anoint my hands, that they would be used as instruments for His glory. 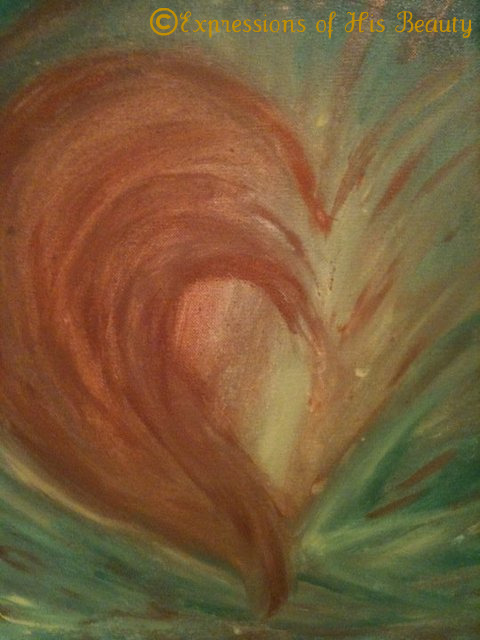 I love how the Lord uses movement and color to express His heart through me onto canvass. I am humbled that I get to do this! Today was amazing. One of my best friends was painting next to me on the other canvass. We did not know that we had picked much of the same color scheme ahead of time. After the worship service was over, we realized that together our paintings shared a common theme of the path to wisdom of a heart being enlightened by the knowledge of God, all of which was confirmed by message that was preached. It’s so fun to serve the Lord in this way! Hope you will come by and read my latest post about hummingbirds and small miracles. This is so amazing and beautiful. I've seen others doing this before and I have been wanting to try it for sometime now…it seems like such a anointed prophetic expression of worship and visualization of His presence. What church do you go to?